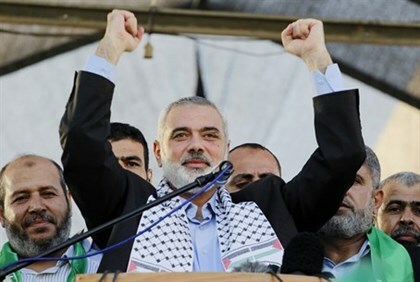 Senior Hamas official Ismail Haniyeh on Friday urged the Palestinian Authority’s leadership to sign the Rome Statute and hold Israel accountable for its “crimes in Gaza” at the International Criminal Court. The Palestinian Arab leadership must not “neglect” the rights of the victims of “Israel’s military assault on Gaza”, Haniyeh said, urging PA Chairman Mahmoud Abbas to sign the Rome Statute. Hamas signed a proposal for the PA to apply to join the ICC in August. There has so far been no probe as the PA is not an ICC member state and its status as a state is uncertain in some international institutions. However, the PA in late November 2012 unilaterally obtained the status of an observer state at the United Nations, opening the door for a possible ICC investigation. In a recent interview, the PA’s envoy to the United Nations Human Rights Council (UNHRC) admitted the PA has no hope of pressing charges against Israel in international courts – because Palestinian terrorist groups are far worse violators of international law themselves. “The missiles that are now being launched against Israel – each and every missile constitutes a crime against humanity, whether it hits or misses, because it is directed at civilian targets,” he said.